We provide a comprehensive range of treatments to suit every skin concern, including tired, dull, acne prone, scarred, or ageing skin. The SkinBase Microdermabrasion facial is the ultimate exfoliating treatment. Thousands of tiny crystals gently remove impurities to leave you with a glowing complexion and super clean skin. The vacuum action during The SkinBase Facial works to stimulate the production of collagen, something we lose gradually as we age. This stimulation and skin’s renewal improves the condition of the skin’s surface – helping to target ageing skin, stretch marks, pigmentation, cellulite, dry and dehydrated skin and acne scarring. 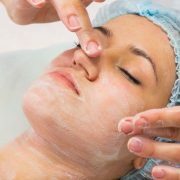 For anti-ageing treatments, all skin types and tones from ages 28 and up will benefit the most from The SkinBase Facial. However, for problematic skin such as acne scarring all age groups can benefit. Includes masque, neck and shoulder message. 60 Minutes. After the treatment, a simple moisturiser with a neutral pH (pH 4.5 – pH 7) and without any essential oils, AHA’s, glycolics or retinol should be applied to replenish lost moisture and to prevent the skin becoming dry and peeling. Sun damage can cause pigmentation and premature ageing of the skin. After a SkinBase™ Facial it is essential to protect the skin from excessive sun exposure by applying a moisturiser with an SPF. This is especially true in the summer months and for clients who are having SkinBase™ Facials to treat pigmentation. Failure to apply regular sun cream could cause the pigmentation to return.